Save 20% off the MSRP of Unitron’s 15854 LED Ring Light. Get this discount when you add the Unitron 15854 to your shopping cart. This popular ring light is in stock and ready-to-ship. Our Featured Product promo is valid Monday, June 12, 2017 and runs through Friday, June 16, 2017. 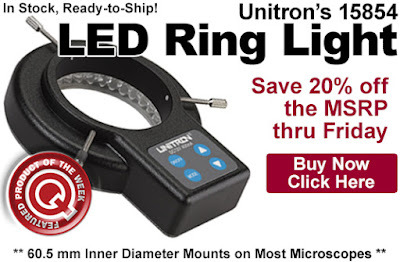 This popular Unitron LED Ring Light fits just about any stereo microscope with a diameter of 60 mm or less. It features a 10-step variable light intensity, sectional light, 72 LED bulbs, and a color temperature of 6400 K. For further details please see the 15854 product page. Click here to shop for the Unitron 15854 Ring Light. For further questions, call us (800-966-6020), or send us an email. Please note: This promo is valid only at QSource.com and expires on Friday, June 16, 2017.